It is interesting when designers send out their clothes from a collection yet to be presented to celebrities days in advance of their showing. Billed as a ‘sneak-peek’ in to the work to come, it gets talked about. It certainly gets blogged about (Hello!). But if we really got down to if it was necessary… That would be debatable. Undisputed is the fact however that in the age of digital everything, it leaves a footprint right away. Perhaps just what the P.R hired for the label wants. That said, how does it serve the brand any purpose when a celebrity is spotted wearing an outfit months in advance of its showing? Does that mean that the outfit (even collection) has been in production and in the market already? So then, what purpose does the showing at a Fashion Week serve other than as a P.R and branding (not a very good one at that) exercise? Forget months, let’s talk about a year. Ms. Reddy presented a collection that had pieces that we’ve previously seen as far back as June of last year. Kosher? We think not. Fashion Weeks serve many purposes, no doubt there. Create a buzz and further an identity of the brand. Showcase innovation, craft, creativity and design. And perhaps most importantly, strike a relationship with the ever so important buyers. Especially true for a nascent industry like ours (we’ve earned the right to say “ours” haven’t we?). But if a collection is already doing the rounds, what purpose does it really serve? And how is it fair to the few good designers doing great work? A pair of fashion ingénues we may be but pray tell, what are we missing here? If you thought Priyanka was the only lucky gal to wear an oufit before it was shown on the runway, think again! Ms. Chabbria made an appearance at the MTV Movie Awards wearing a colorful printed mini from Swapnil’s latest collection days before the presentation. Can’t say we are fans of the dress, especially the jarring silver leather detailing against the print, but what perplexed more was the choice of tan sandals. Dresses like these wouldn’t have been our first pick for a major Awards’ Red Carpet. Then again, the dress on Aarti wouldn’t have been our pick ever. Though both wore pink gowns with sheer accents, only one’s made us really cringe! Yep, that would be Aarti’s. P.S. Swara is in Sailexx and and jewellery is by Amrapali. 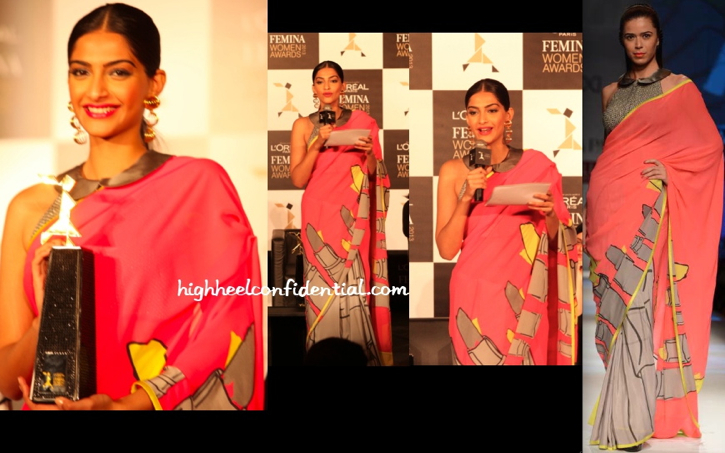 She was styled by Maneka Harisinghani. And Aarti is in Swapnil Shinde. Pointing us to this Ditto! 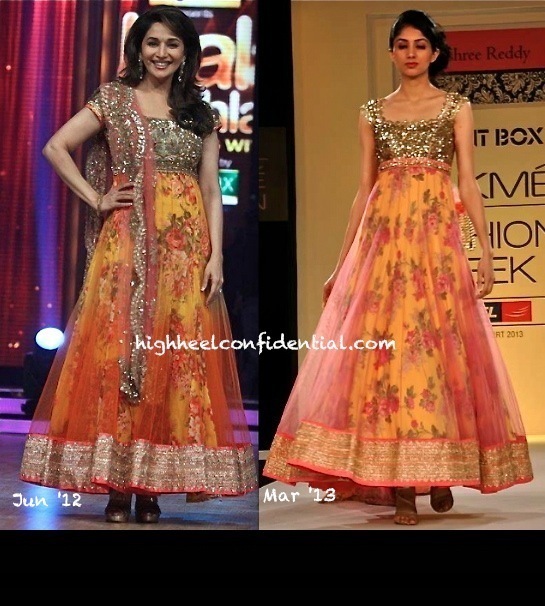 was Ritika who spotted Shamita wearing the same orange suit as Aarti from LFW last year. Both wore their suit with glittery sandals. Care for either?